It takes energy to launch a spaceship into space. If it takes 1 energy unit to warm 0.25 g of water by 1°C, then it takes over 15,100 energy units to put that 0.25 g of water into earth orbit. The most powerful engines designed to lift rockets into space were part of the Saturn V rocket, that was built by the National Aeronautics and Space Administration (NASA). The rocket had three stages, with the first stage having the capability of launching about 3.5 million kg of mass. About 2.3 million kg was the actual fuel for the first stage; rockets in space have the unpleasant task of having to take their own chemicals with them to provide thrust. It takes a lot of energy to launch a rocket into space. The Saturn V rocket used five of the most powerful engines ever built to take its initial step into orbit. 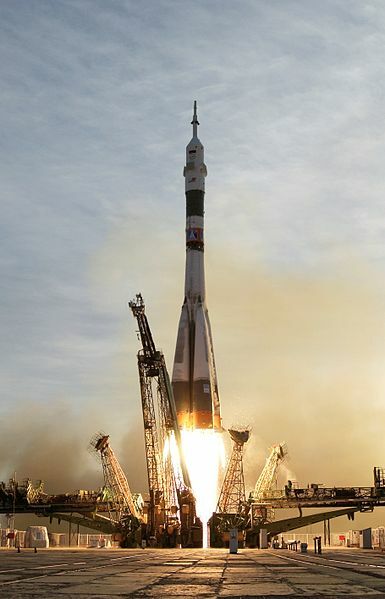 Source: “Soyuz TMA-5 launch” s in the public domain because it was solely created by NASA. Having to carry its own fuel puts a lot of mass burden on an engine in space. This is why NASA is developing other types of engines to minimize fuel mass. An ion thruster uses xenon atoms that have had at least one electron removed from their atoms. The resulting ions can be accelerated by electric fields, causing a thrust. Because xenon atoms are very large for atoms, the thrusting efficiency is high even though the actual thrust is low. Because of this, ion engines are useful only in space. Ion drives have low thrust but high efficiency. They have already been used on several space missions, including NASA’s Deep Space 1 spacecraft and Japan’s Hayabusa asteroid sampling probe. 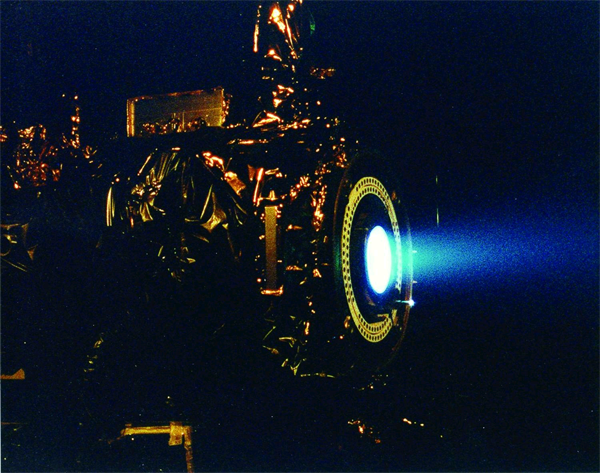 Source: Photo courtesy of NASA, http://commons.wikimedia.org/wiki/File:Ion_Engine_Test_Firing_-_GPN-2000-000482.jpg. Introduction to Energy and Chemistry by Jessie A. Key is licensed under a Creative Commons Attribution-NonCommercial-ShareAlike 4.0 International License, except where otherwise noted.